SMARTLY dressed with his arm around his father’s shoulder, toddler Taha Fiazi looks curiously at the camera for a final portrait before his family were to board a boat for Australia. Taha, his father Ezatullah and mother Hakima Abasi left Indonesia last August full of hope for a new life free of the persecution they faced as Afghanistani Hazaras. They are among whole families, groups of cousins, fathers, who have boarded boats and never been seen again and children who have disappeared in the dangerous waters between Indonesia and Christmas Island and whose mothers are now in limbo between hope and grief. Photographs of the lost in happier times are now contrasted by accounts from their families of life racked by uncertainty, often without a breadwinner. Their stories are the true toll of the crisis at Australia’s borders with at least four boats, carrying almost 300 people vanishing and hundreds of other asylum seekers are known to have drowned in the past four years. The Hazara community in Australia is using a Facebook page to plead for information about 40 of the missing. Little Taha’s family are devastated that the inquisitive boy and his parents have been lost at sea. “He (Ezatullah) was a very good person, he was a labourer and hard worker, he was a family man,” Taha’s uncle Avazali Etemadi said through an interpreter from Iran. His wife Zahra Abasi, Hakima’s sister, had trouble coping, he said. “I put his last photo on Facebook so if there is any news for them from anywhere they can tell me,” he said. Mushahid Hussain could be any 18-year-old, anywhere in the world. The photograph his brother has used in a search shows him sporting white earphones with a stylish black suit jacket slung over one shoulder. His brother Shafiq said the teenager had gone to Indonesia with friends and a cousin in a bid to reach Australia, a decision his family still does not understand. “It is very, very hard. I can’t tell you how difficult,” Shafiq said. 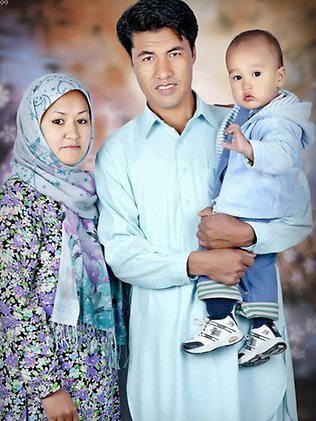 Syed Mustafa, 23, called his family in Quetta, Pakistan, where Hazaras are routinely attacked, at 2am in December 2011 to tell his family he was boarding a boat headed for Australia. It was the last they heard from him, his vessel later sank. “The boat was overloaded. We are still hoping that he is alive,” his sister Shanaz said. Sayed Murtaza’s 21-year-old brother Sayed Asif and his neighbour Mohammad Mohsin vanished after their asylum vessel sank in December 2011. “They are all jobless, they don’t have any work, they don’t have any money,” Mr Murtaza said of his neighbour’s wife and children. There are two toddlers without their father in Quetta. Abbas, also known as Mossa, left his wife and two young children behind last year after he was threatened with death, friend Madi said. “He is missing, we don’t know about him anymore, it is very difficult for his wife, she didn’t have anyone to support her, she didn’t have any way to find her husband,” he said. Father of two teenage daughters and two sons, Ramazan Ali stared seriously into the camera lens for a portrait in August last year. He has been missing since his asylum boat sank near Indonesia last month, with only 14 survivors out of 70 who were on board found. His family would rather believe he was in jail in Indonesia for trying to leave by boat, than think he is dead, nephew Shukrullah Rajai said. “His family think Ramazan will be all right,” he said. Mohamed Hatif, a refugee living in Adelaide, has been trying to find his friend Amin so that his wife in Quetta can have certainty about his fate. “Amin’s wife doesn’t know if he is dead. She says `maybe Amin is on an island,”‘ he said. Arif Hazara, 18, who is studying for his Year 12 exams at a Melbourne school started the Hazara community Facebook page to connect people but as the toll at sea mounted he began posting pictures from families desperate for news. Having left his own parents and four siblings behind he suddenly found himself trying to help connect other families with their lost loved ones, despite little hope any of the missing will be found alive. Arif and a group of friends spent eight “very scary” days on an asylum boat crammed with 52 asylum seekers with the perilous journey made worse when the engine broke down. He was found by Australian authorities to be a refugee. “There are hundreds of families who have had their relatives or their father or mother or sister on the boats and they have never heard of them,” Arif said. “We have reports of boats lost.